Kitchens are one of the busiest places in the house and definitely needs the most storage as there are plenty of utensils and cutleries that you need to keep. Open shelving is a really stylish and gorgeous trend that looks really good in the kitchen so get inspired with these ideas. This beautiful modern kitchen decked out in grey and marble looks really good with some simple metal shelves that takes advantage of all that vertical space. The stainless steel elements add a modern touch. A monochromatic kitchen that uses mainly white is clean and effortlessly neat uses white shelves that melts neatly into the background. This has the added effect of making the eclectic kitchenware look like they are floating and becomes the focal point of the room. Sometimes you may have a china collection that looks too beautiful to be stored behind closed doors so using open shelves are a great idea. This custom made open shelves perfectly display the china and has additional drawers for your ordinary kitchenware too. Can’t decide between open shelves or closed cabinets? 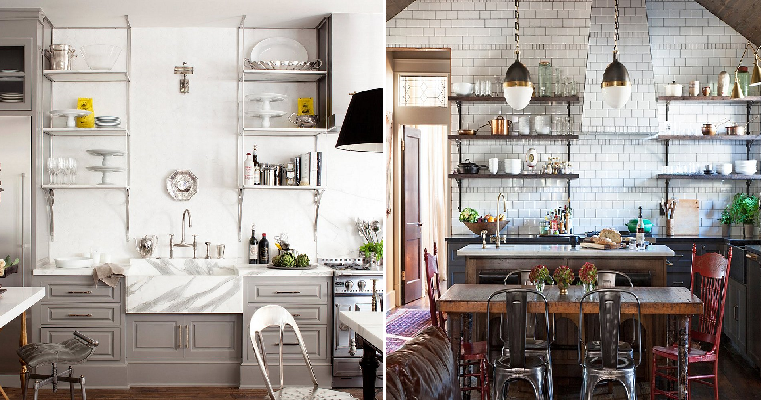 Why not get the best of both worlds and mix both of these together for some pretty kitchen shelving. A stylish kitchen needs to have cool walls and this kitchen’s subway tiles are both classic and timeless. The rustic feel of the kitchen is amplified with the addition of the dark open shelves that look awesome on the walls. This vintage looking kitchen is a throwback to the bygone eras and nothing looks more fitting than the gorgeous retro open shelves that have a nice teal colour painted inside for contrast. The white background offsets the colour to make it pop even more. Black is a timeless colour that looks great on its own but this open shelves take it to the next level with some mirror backing. Your kitchen will look so much more airy and spacious with the light reflecting mirrors as decor. This one is for the renters out there who need some storage space in their kitchen but aren’t able to make permanent adjustments. Invest in an open shelving rack that can be used to store all your stuff and place it against a bare wall for the best effect.